Planning a holiday in the US this year but not sure where to go? 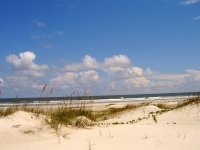 Lonely Planet's Best in Travel 2014 delves a bit deeper to showcase places that should be on your radar – and we're very pleased they featured Cumberland Island in Georgia. One of the most underdeveloped places in the US, Georgia’s Cumberland Island is magical. If you picture virgin beaches, windswept dunes, feral horses, wild turkeys, tiny fiddler crabs, beautiful butterflies, skittering armadillos, mossy old oak trees, breathtaking sunrises – that’s Cumberland Island. Most of this unspoilt paradise, the largest of the Sea Islands in terms of continuously exposed land, is national seashore. On the ocean side are 18 miles of pristine sandy beach you’ll have all to yourself. The rest is maritime forest, marsh, mudflats and tidal creeks. Plus it’s all laden with hiking trails (50 miles to be exact) and camping is permitted. St. Mary's is the island's gateway and where the mainland facilities and ferry terminal are located. Stafford Beach has some of the best sands in the South with the magnificent old Greyfield Inn houses non-campers and the only restaurant on the island. Request a Georgia information pack.